TY Mecha for the template. Omen dc'd after gp 1 race 3 with 6. 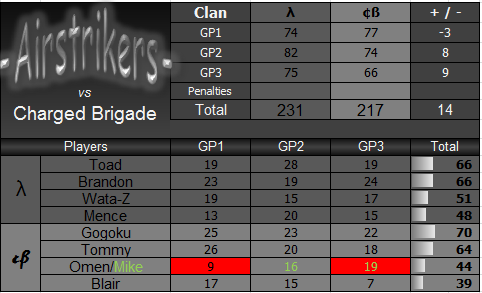 GGs cB, apparently I trolled a lot. [3:02:08 PM] m-: should've been over 60 but I was the only one getting stop trolled 3/4's of the races. [3:03:31 PM] m-: yep that sums up this war! stressful war for me, but good games to everyone that played. Oh, what a surprise, congratz A ! Roro didn't play, that's all. Blair's true skill shows in PL. Mecha wrote: Blair's true skill shows in PL.